Uglyworld #630 - Independence Day (185-365), originally uploaded by www.bazpics.com. 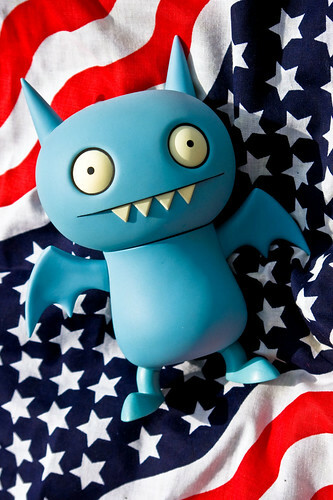 After being over in America earlier this year Ice-Bat has been reminding all of the other uglies here in Germany that the 4th of July is American Independence Day, thankfully he's actually done some homework on the history of what is now one of the most famous American holidays. "Independece Day is whens America gots it's independence from the Britain of Greats, this was many years befores, in 1776's!" All the other little guys love it when it's story time, normally the stories come from Babo, so they always welcome a change of speaker too. "The celebrations of those peoples signing the declaration of independence is whats everyone celebrates nows in moderns time, with fireworkers, barbie-q's, eval carneevals ands other cere-monies and parties!" Wage pointed out that if Ice-Bat had taken the time to tell them about the "fireworkers" in advance they could have sorted some out for this evening, ah well, maybe next year! Love it! Have a great day, and maybe set off some fireworks too!